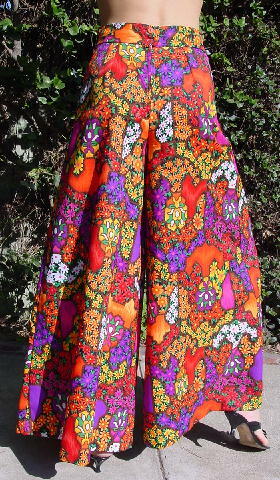 These vintage long palazzo (full skirt-like) pants have a 2" wide waistband with two orange button closures and a 6 3/4" long back zipper. There's no fabric tag, but it feels like a very nice synthetic. 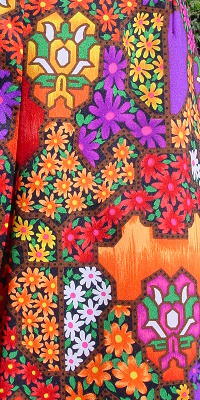 It has flowers and geometric figures in light, medium, and dark orange, white, magenta-purple, emerald green, apricot, and white. She loved them, but didn't wear them because they're too big. She just didn't want to part with them. 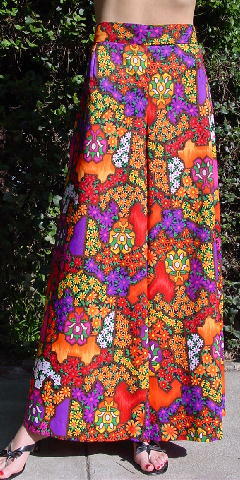 waist to crotch 14 1/2"
waist to leg bottom 42"
bottom leg side to side 20 1/2"